Israeli settlers, on Thursday, uprooted over 30 saplings belonging to Palestinian farmers in Tarqumia town, to the west of Hebron, said a local official. 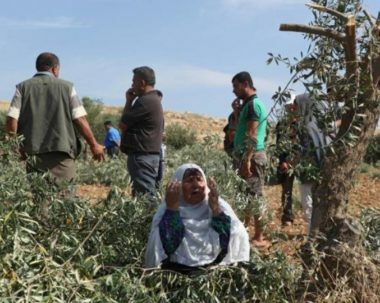 Head of the Agricultural Damage Documentation Section, Hashem Badarin, confirmed to WAFA that settlers from the nearby Telem settlement destroyed and uprooted over 30 olive, grape and almond trees belonging to the al-Ja’afra family, in al-Tayba area. Badarn saw the saplings uprooted after he and Shadi Fannun, who represents the Palestinian Agricultural Risk Reduction and Insurance Fund, made an inspection visit to the area. Settler violence includes property, church and mosque arson, stone-throwing, uprooting of crops and olive trees, attacks on vulnerable homes and residents, among other such acts.